Control all the little stuff that isn't in the UNIX programming books. Use the cache right, and your code runs fast. As the number of processors grow, Linux either can hit a performance wall or explore new algorithms. Crypto techniques give device drivers a new security check. Give your GUI apps a scriptable test suite with simulated X clicks and input. 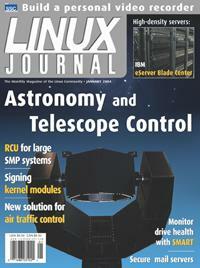 The software that controls research-grade telescopes can control your telescope too. Your software can break free of the box and control lights, bells and motors in the real world. You don't have to be a LISP hacker to customize Emacs. Keep an eye on your drives' health with an easy-to-configure tool. Using Linux as a testing platform for mission-critical software. Create a custom PVR that works your way and even burns archive copies.